A nostalgic memory recall as this is all it takes to summon a craving. Well, if you haven’t, you must have done at least this for sure – chew gum and drink water thereafter? Not the best analogy I can think of, but recognize how cool the mouth feel is? I meant to correlate that fun part. Otherwise, it is a mellow-green translucent, gently striped sour-bitter fibrous fruit with a sweet after taste, its size ranging from a marble to a walnut. There is another smaller floral shaped tart gooseberry minus the stripes too, but for now I’ll stick to the bigger one. By size, that’s how we distinguished them anyways..
As kids, we loved eating gooseberries raw, simply sprinkled with some salt and ground black pepper or red chilli powder (akin to ground cayenne pepper). 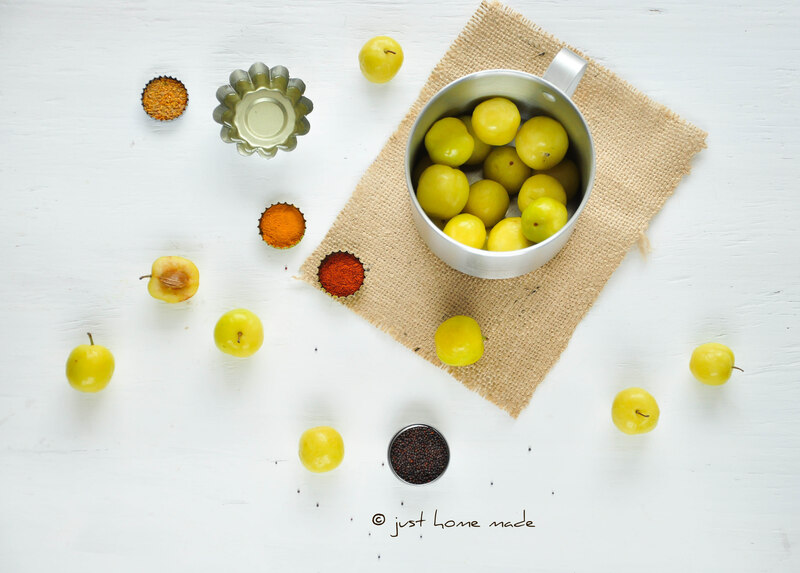 As my taste buds expanded their horizon, I figured they taste even better pickled, in preserves and relishes – sweet and savory quasi-similar to other acidic fruit. I have not been quite lucky yet to find fresh Indian Gooseberries where I live in the US. The closest that money can buy are frozen, but are not best suited for pickling. It was the first time ever that I saw sour plums and it was at a persian/mediterranean food market. 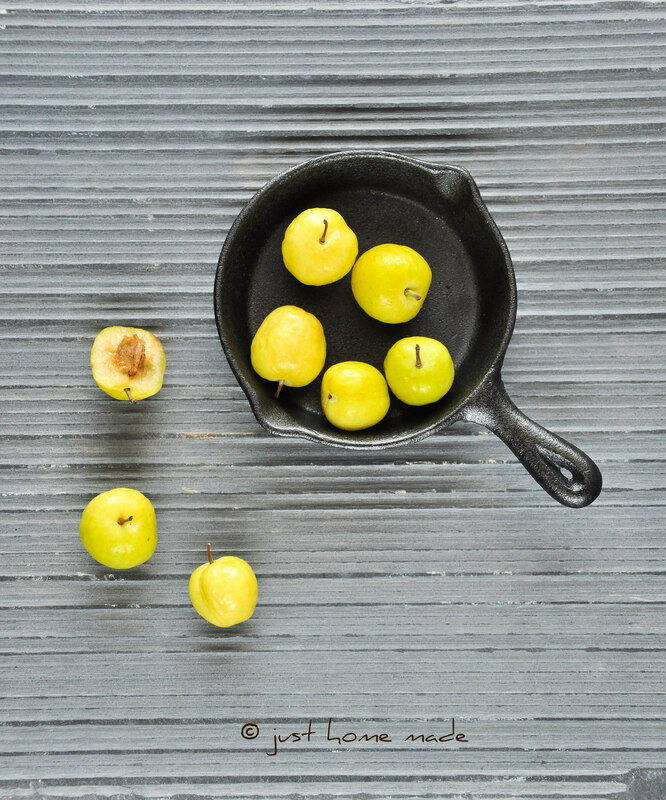 But they looked so eerily similar to Amla (Nellikai) aka Indian gooseberry, that I felt a warm fuzzy feeling in my stomach, must be the flashback of childhood memories and the promising possibility to re-create the food experience I so enjoyed during my school years. I won’t hesitate to say I wasted no time in buying them. I knew little to nothing about them except for their uncanny resemblance to something familiar to me from childhood. Apparently, sour plums are nothing fancy but unripe plums with a palate cleansing sourness , sized tad bigger than bing cherries. To my surprise, they weren’t as sour as their look-alike, as I imagined. I did not taste before buying, I never really do. This was my first attempt at pickling, to be very honest and I promptly borrowed my mom’s instant gooseberry pickle recipe where they are sautéed whole with the stone intact. Because this recipe is as simple as ABC, there’s not much to mess around. Only condition requires you to use dry-everything from jars to ladles to pans and spoons for the fear of spoilage otherwise. Moisture is also the number one friend of molds, you see. Substitutes are just that substitutes, they never quite match the original. But then, cravings are stubborn things, they just don’t die without fighting hard, you know. Some cravings are easy to satisfy, as simple as go to the nearest market, get the stuff, cook, eat and be happy. But then there are others, for which even the most up-class markets can’t come to the rescue, for that matter. Not because one can’t afford to buy, but simply because one may be so far away from their homeland and foods so local, it may just be impossible to find them. Drooling for foods from childhood and waiting for the next fortunate time to satiate those tingling taste buds is all one can do. And for those times, substitutes are the king, like Sour plums fill in for gooseberries here for an instant gratification. In that attempt, I got to discover a new ingredient in old light, a win-win for me! 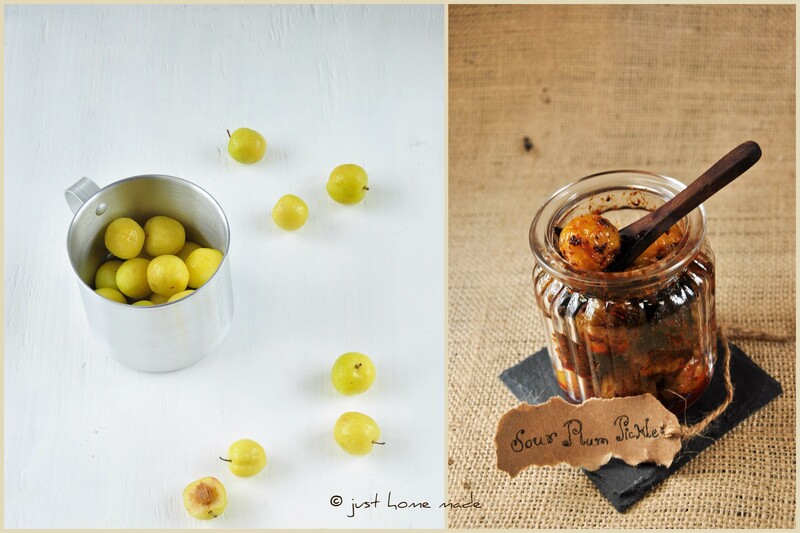 Do you know of any place in the US where you have had luck with finding fresh Indian gooseberries? 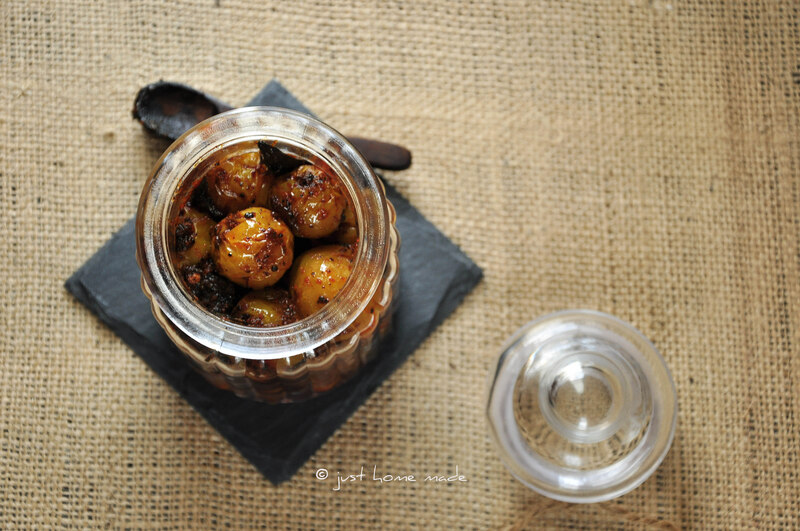 Adapted from a recipe ideal for Indian Gooseberries (Amla / Nellikai). Wash sour plums and pat completely dry on a towel. Heat oil in a heavy bottom pan or an Indian wok over high heat. When the oil is hot enough or shimmering, add mustard. When mustard begins to splutter, reduce heat to medium and add broken red chillies followed by crushed fenugreek seeds and give it a stir. When red chillies turn dark brown (make sure the fenugreek seeds are not burnt or they’ll be very bitter), add asafoetida and turmeric and ground mustard quickly followed by the whole sour plums. Sauté on medium high heat until they become soft. Do not cover to avoid moisture from being trapped. When the plums are soft (check with a fork or spoon), add salt and red chilli powder, give it a good stir and take it off heat. Let cool completely before transferring to a clean and dry jar. Store covered airtight in the refrigerator. Goes very well with curd/yogurt rice. I would eat them as is any day though! This pickle belongs to the instant pickle category and tastes best when used within the first few days. Previous Post: « Plate to Pixel Photography Workshop by Helene Dujardin | Got Lucky! You took me back to eating gooseberries days .. the water taste sweeter … so very refreshing. At first I thought you made pickle with these and wondered where did u find it 🙂 Now I get it. It looks so yummy. I would love that with stuffed paratha ..
Kankana, How I wish I could find some fresh Indian gooseberries here..yes, they will surely go very well with parathas..
Woww. Yummy and tempting pickle.. Looks perfect !! What a cute idea; love it! So simple and so fun to make. Can’t wait to try this….sounds lovely. ah..water after nellikai!! that was the best of part of eating gooseberries! I really wish i could take pics as good as yours! how i wish i could find some fresh gooseberries here! you are right the frozen ones are never close to the fresh ones you get, especially if you get the fresh ones straight from the tree! 🙂 The pickle look gorgeous in that little jar. All pictures have been showing life-like colours and shapes which made my taste buds water …even before nellikai…!! I had some pickle made with sour cherries. Searching to find out what recipe was used. I am going to try to make them with a nellikai recipe. Maybe adapt this one? I want to keep them longer than 2 weeks. This looks so great! 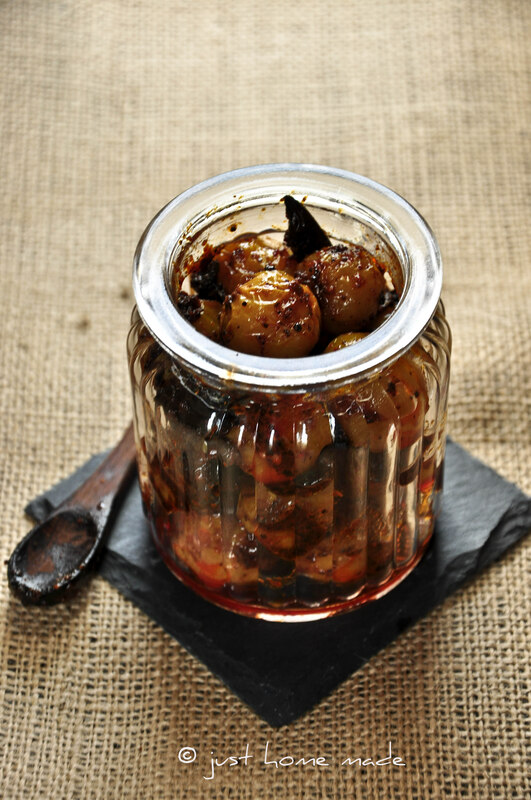 I’ve never tried plums pickled before – but I think this needs to be the next thing I make. How long do these last in the refrigerator? Thank you for sharing!